The original reason for the trip was to attend the KitchenAid Cook For the Cure Culinary Showdown and Chef’s School. Some of you may remember that I was a judge for the culinary showdown last year, which was a big highlight of my year. But this year, Ethan and I both got to attend to share some behind the scenes sneak peeks of the Chef’s School and the Culinary Showdown with FBC members and followers. We had a blast and I’ll have more on that later! We decided to take what could have been a two day trip and turn it into two weeks (because we’re a little bit insane in that sense!) by visiting some clients, doing some site visits for FBC2015 in Montreal and tacking on a few days for some well earned R&R. I have lots of images and delicious eats to share (check out my IG feed for the highlights!) 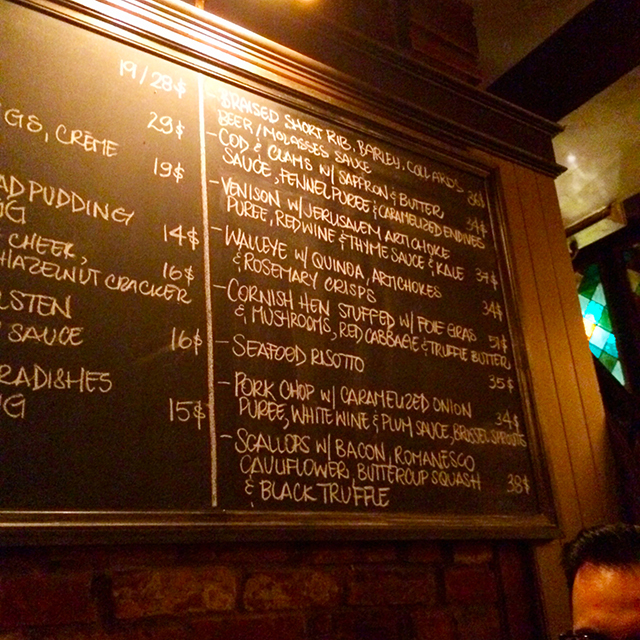 but I thought today I’d write about our dinner at Garde-Manger. Garde-Manger is one of Chef Chuck Hughes restaurants in Montreal (you know… Chuck’s Day Off…yeah… THAT Chuck Hughes) and one that we’d hoped to visit during the summer. Unfortunately, we don’t really plan that well for these things and the restaurant is tiny and not open on Mondays and you better have a reservation that you made at least a month in advance if you hope to eat there on your trip. Yeah… we didn’t manage to do any of that back in August. But this time we did! Or rather, Ethan, the scheduler extraordinaire on this particular trip, did. E was on it and, with three weeks to spare we found ourselves with a 9pm Sunday reservation for 3. We asked our chum, Jan at Kitchen Heals Soul, to join us for food – and being like us and loving food, she promptly said yes. There were a few tense moments when our train out of Toronto was delayed for hours. Never mind our meetings… what if we missed our reservation with Chuck?? But we made it in time. Phew! Was Chuck there? No. Ha! We didn’t expect him to be. Chef Hughes was one of the chefs competing in last year’s KitchenAid Culinary Showdown so as a judge, I did get to eat his cooking. 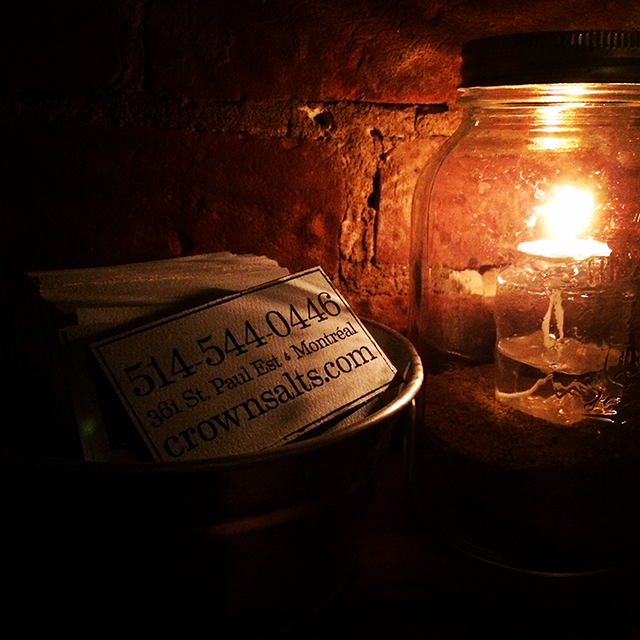 Regardless, the kitchen team at Garde-Manger have all got it going on. 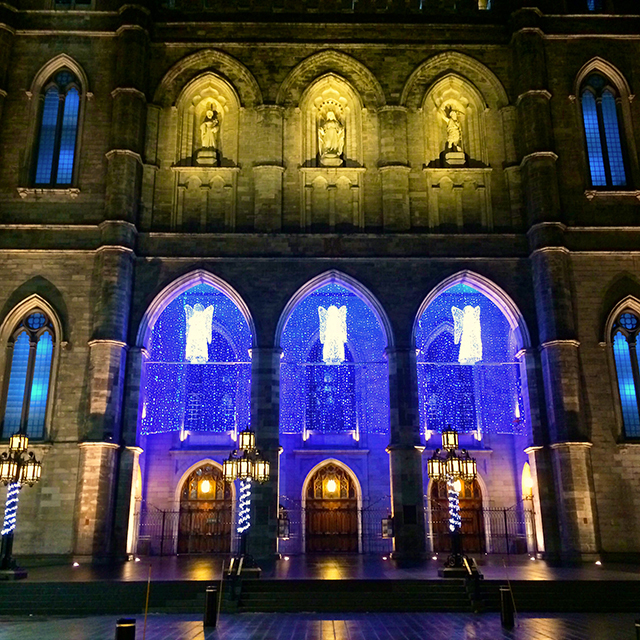 The restaurant was just steps away from the hotel so we wandered up to it in the rain, passing by Notre Dame Basilica all lit up for Christmas and made a verbal note that we’d stop on our way back to take some photos. As soon as you walk in there is a fireplace in the entry that I took full advantage of to warm up. The menu board is in full view from different vantage points so even if you have to wait a few minutes for your table you have the enjoyment of perusing the evening’s selections. The restaurant is small (I believe the word is intimate), dark and very cozy. Not conducive to food photos at all. But I did try! With my handy new iPhone 5S. It did ok but still grainy. These are not a true representation of the food – I prefer to think of them as memory snaps of a really fun evening with good friends with great food and a fun atmosphere. We kicked it off with cocktails. 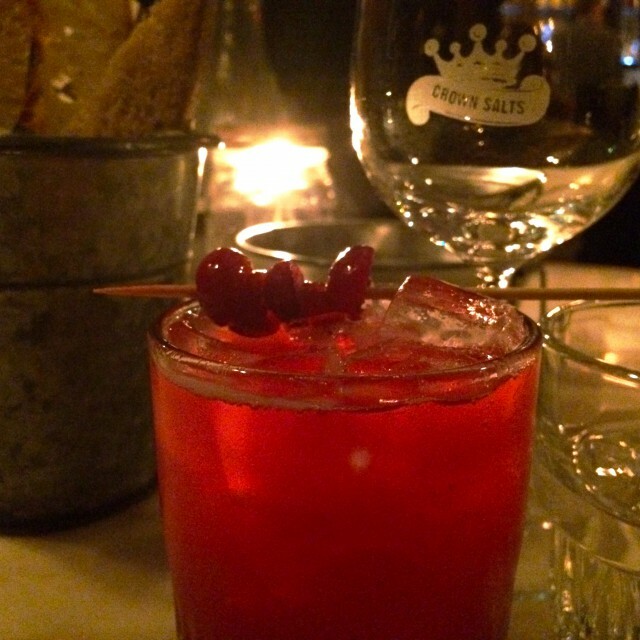 I had this delicious Ruby Crush (vodka, vanilla and cranberry puree) and valiantly refrained from ordering 2 more!! Our plan to get the most out of our meal was to order a two appetizers to share and then make sure we all got different entrees so we could do a little more sharing if we wanted. 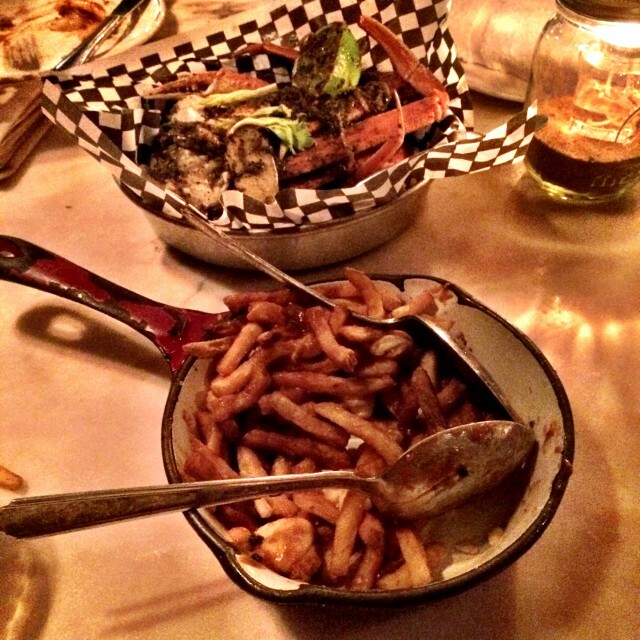 So we started with the lobster poutine and the spicy jerk crab legs. The poutine was the best I’ve ever had. I didn’t even care about the lobster! That was just a bonus. The gravy was perfect, the fries were proper poutine fries that stayed nice and cripsy and, of course, real Quebec curds. For me it was all about that gravy. It had a touch of sweetness to it that made it so delicious. Every time I eat Poutine in Quebec I realize that anything we get here in BC, no matter how good, is just a poor cousin to the real thing. The sad part of all this is I had been battling a stomach bug the first part of our trip in Toronto and was a little nervous about eating anything spicy. So I just had a small bit of the crab and left that to Jan and Ethan to messily devour. What I had was pretty tasty though. The menu had a lot of interesting choices and it was not an easy decision to narrow it down to just three. But in the end we went with braised short ribs for E, walleye for Jan and the pork chop for me. Everything was delicious. The only sad point in my meal was the very large helping of mushrooms that came with my pork chop. There were many more mushrooms than brussel sprouts on my plate, despite the fact that the sprouts were listed on the menu but the mushrooms weren’t. You all know my feelings on mushrooms. (insert scrunched up face). Had I known, I’d have ordered a different dish. But in the end Ethan ate them all so nothing went to waste. At this point, we were completely full and couldn’t even squeeze in dessert between the three of us, as tempting as the dessert menu was. So we called it a night, walked Jan to her car and then headed back to the square by Notre Dame. 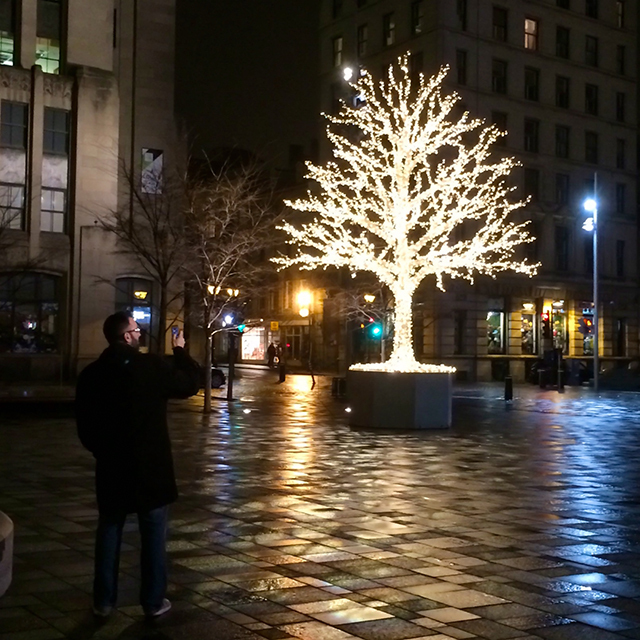 Before we headed out on this trip I told Ethan the only thing I really really really wanted to do or see in Montreal was find sparkly magical Christmas lights. We didn’t have to look very far. Montreal is like a winter wonderland (Toronto wasn’t bad either!). Vancouver really doesn’t embrace Christmas the way eastern cities do. I don’t know if it’s the weather or the extreme political correctness we experience here but it never ever feels as festive as other cities do in December, which always makes me happy to escape it for a while at Christmas! 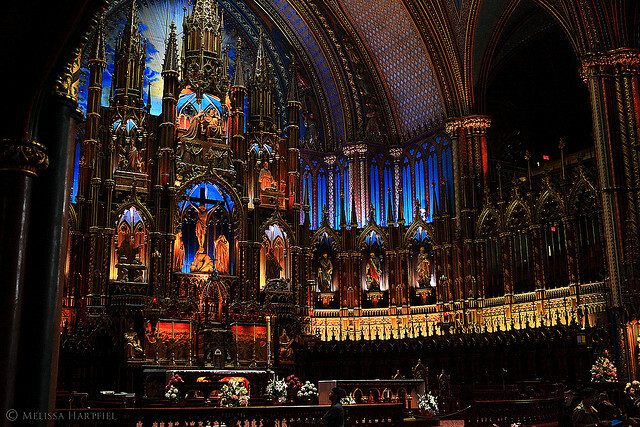 Notre Dame is one of the most beautiful churches I have ever been in anywhere in the world (it’s also one of the only ones that lets you take photos inside). I took the above photo and the first photo in this post on my very first visit to the city in 2009. It is a truly stunning spot that is absolutely worth a visit, regardless of your religious affiliations, and sparkly Christmas lights or not! And of course… it’s always better when you experience it with friends! No fun fighting a stomach bug but I’m glad that you did manage to enjoy some of the offerings at Garde-Manger. You make me dizzy with your schedule of late! 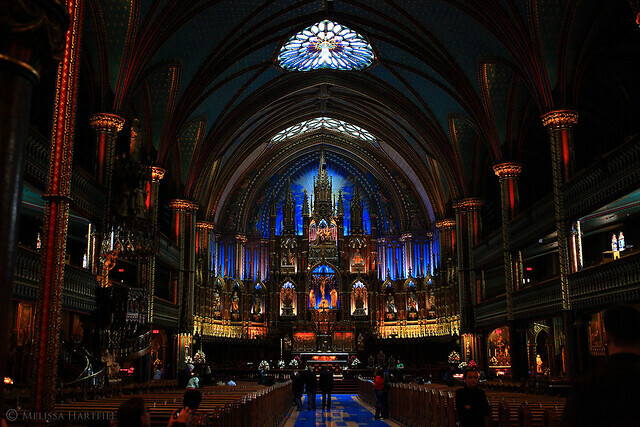 Your photos of Montreal lit up are beautiful and those of Notre Dame are stunning. The first time I walked into that basilica and looked up I felt that this must be what walking into Heaven looks like.